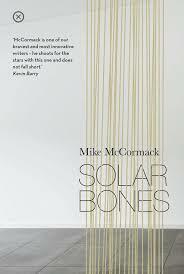 Mike McCormack’s Solar Bones is, in many ways, an apocalyptic novel. No wormhole opens in the sky threatening otherworldly invaders, nor are its streets crowded with shambling corpses, but behind the layered normality, as paragraph after paragraph piles up, thought over thought, there is an end of the world insinuation, like rot, weakening the structures of the everyday. He tells Darragh a joke about a lawyer, a doctor, a politician and an engineer arguing about which profession came first. The engineer proposes that it must be his as God was the first engineer when he created the earth and the heavens out of chaos. “Who do you think made the chaos,” says the politician. Marcus’ doubts can be seen in his original intention to join the priesthood before turning to engineering, two different ways of understanding the world. The novel quietly questions us on how we understand the world and how much control we have over it. In the face of our limitations, it offers a very ordinary love. The novel’s conclusion is revealed in its blurb (or maybe I’m just a bit slow) which luckily I hadn’t read, and would suggest any potential reader avoid. Often beautiful, at times elegiac, it is an immersive experience from which readers will not emerge untouched. You are currently browsing the archives for the Mike McCormack category.